SBI opens digital branch in Hyd. Pradeep Kumar, Managing Director, Corporate Banking, State Bank of India (SBI), on Tuesday inaugurated sbilNTOUCH digital branch at DLF Campus Gachibowli in the city. Hyderabad: Pradeep Kumar, Managing Director, Corporate Banking, State Bank of India (SBI), on Tuesday inaugurated sbilNTOUCH digital branch at DLF Campus Gachibowli in the city. sbilNTOUCH (digital) branch is a unique one, and first of its kind in Hyderabad circle in both states of Andhra Pradesh and Telangana. It is fully digitized, user friendly and has facilities like account opening, cash deposit, ATM, Swayam (pass book printing) machine, internet banking kiosk, digital touch screen, including sourcing of loan applications. Customers can carry out their transactions on their own in the branch. However, bank staff is available to offer any guidance to the customers if necessary. They can undertake all the transactions including account opening in digital way. 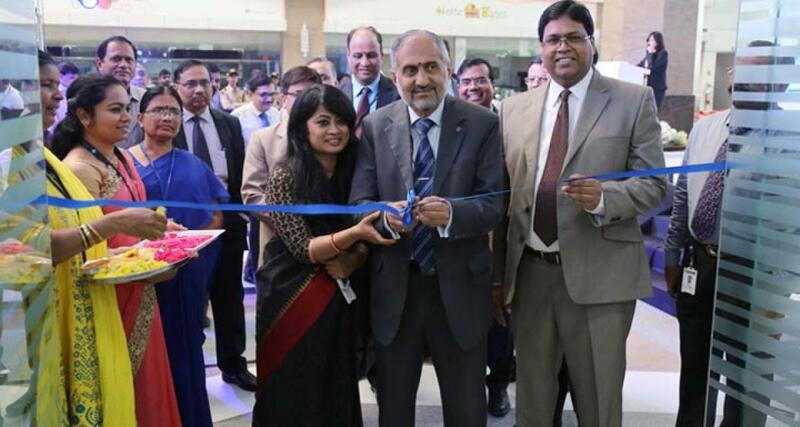 Hardayal Prasad, Chief General Manager, SBI Hyderabad Circle, Giridhara Kini, General Manager Network-1, Rajesh Kumar, Deputy General Manager (B&O), AO-1, and C Gowri Shanker, Regional Manager, Region-4, graced the occasion.